This beautiful weather has got my lusting for allll of the evenings spent out in the garden with a barbie and some bevs’. 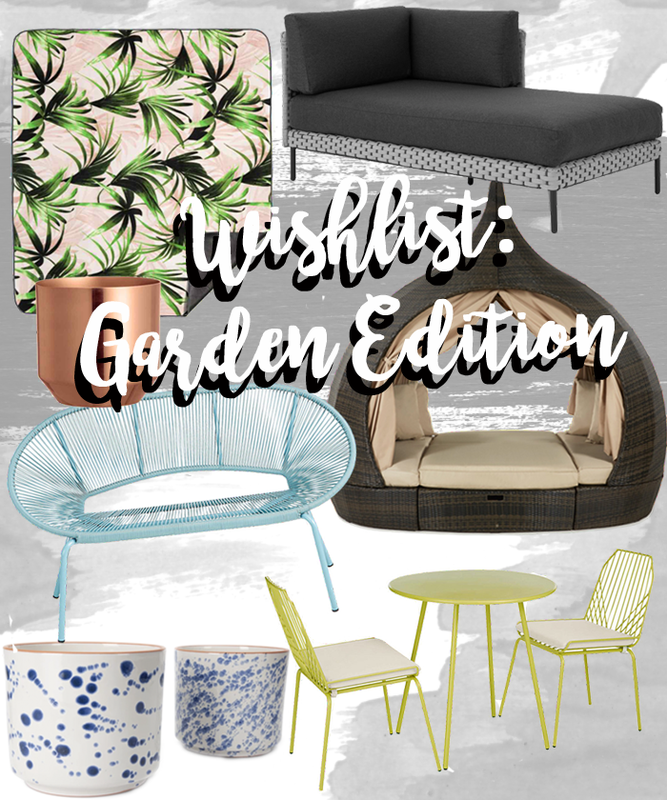 Although I’m totally not in the position to be purchasing gardenware yet (my own house would probably be a good start), there’s nothing wrong with a little lusting right? First stop is some comfy furniture, and Fishpools Gardens Section have totally got that covered. Anyone else seen Zoella’s new crib and that massive corner sofa? So dreamy. Instead of sofas, I had a browse at their daybeds, the kind of thing I can totally imagine in some foreign sunny country. At least with the design I’ve chosen, it’s a bit more waterproof for when the English summer decides to end!! I loved the idea of introducing lots of colour into the garden and the M&S table and chair and sofa brings just that. Throw in a plant-print blanket and some adorable plant pots and you’re good to go!